It's been a while on the road side of their bike range, but MOOTS has decided to revamp their already incredible lineup with a couple changes for 2010. 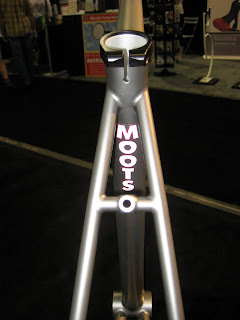 The Vamoots CR has really only changed in name and the updated Vamoots has new geometry (which we will review in the future) but the big news is the totally new MOOTS RSL. 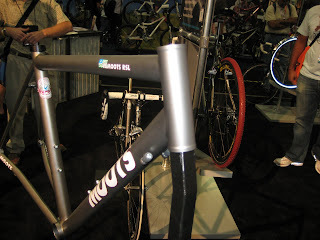 In the past Moots had the SL which for the road and Psychlo X models used Reynolds 6/4 tubing for the main triangle. But other than that, the SL model looked the exact same as the 3/2.5 version. For 2010, that is definitely not the case! The hard part is finding a starting point since everything has changed! 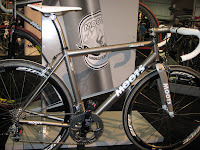 This is a completely new MOOTS, from the bottom bracket to the head tube to the seat post. 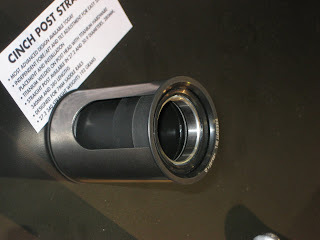 The bottom bracket is the heart of the new MOOTS RSL. They use the new SRAM press fit 30 oversized bottom bracket. Their objective is to maximise stiffness in the bottom bracket cluster where power from the cranks is directly transferred from rider to the rear wheel. Looking at this in person I'd say they have easily met that goal. 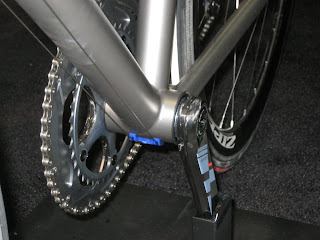 MOOTS also says that by doing this they have delivered 38% more stiffness and reduced weight by 5%. The result being a more immediate and efficient power transfer from rider to wheel during sprints and attacking climbs. This is what is going to help MOOTS bridge the gap to all the way oversized carbon bikes out there, only with a MOOTS titanium bike you are getting the reliability, durability and longevity of a metal bike (not that there are not some nice strong durable handmade carbon frames out there like hmmm Parlee, but well made titanium is king). The oversized bb shell is also used so that MOOTS can use a oversized down tube, seat tube and chain stays. Like I said, this is a brand new MOOTS! Then we move up to the chain stays which are also entirely new. 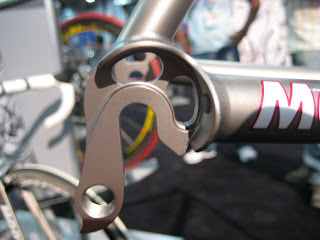 MOOTS calls them 6/4 titanium micro diameter seat stays. Their objective was to reduce weight and increase strength with the results being 32% lighter and 20% smaller resulting in a laterally stiff rear triangle and lighter overall frame weight. I can tell you they look stunning as well. 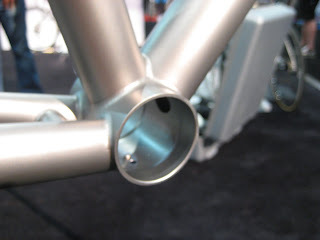 MOOTS went to work on the head tube as well, they machined the outer wall to save weight and also machined the vent holes inside the frame! This is attention to detail in every way. By doing this they made this part of the frame 21% lighter than a standard Vamoots. In this picture you can see a few details. 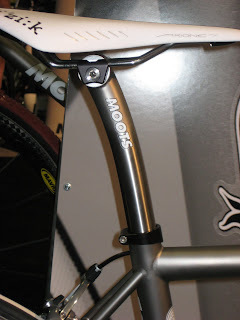 One, the slimmer seat stays and two, the fact that MOOTS chose to use a non integrated seat post clamp! This is pretty big as MOOTS is really known for this feature. But there is a reason for this; they can't! 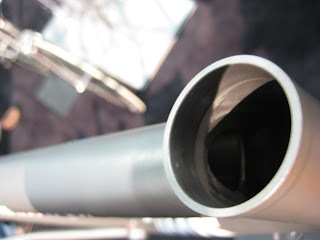 The seat tube is oversized and extremely thin and they would burn through or warp the titanium by brazing a clamp on, hence the new style on the RSL. The third thing you may not of noticed is that MOOTS also developed an oversized seat post to go along with the oversized seat tube. 30.9 and yes, they make a seat post for this new size as well! 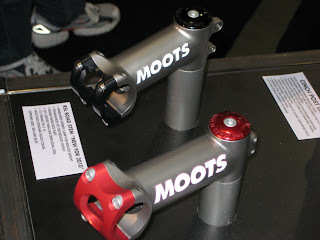 Moots didn't stop with just a new frame and seat post, they made a new SL version of their stem as well. This piece is heavily machined and features 6/4 titanium bolts. 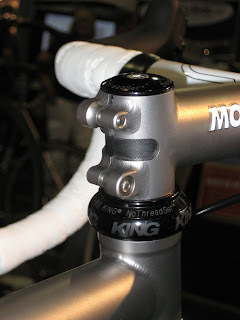 It is 22% lighter than the MOOTS Open Road stem and comes in at 121 grams for a 90mm version. There may be lighter options out there, but none are as strong and beautiful! We have already started taking orders for these and expect the first ones to arrive in January. Give us a call or stop by the shop with any questions or to get on the list! *NOTE: The main tubes are not 6/4, they are 3/2.5 but what makes the MOOTS RSL so special is that they actually send all the tubes to the Reynolds (not composites, but the real Reynolds in the UK) factory and have them internally double butted. *NOTE: The complete bike you see here is a touch over 14lbs with no crazy lightweight parts on it.